People looking for something active to do in their lunch breaks now have another option, thanks to the efforts of the Invercargill City Council and Healthy Families Invercargill. A series of CBD walks has been launched, with one featuring in the Vodafone Workplace Challenge, being run by Sport Southland. The walks, all of which take people around the Invercargill CBD, are part of an initiative aimed at getting people more active. It also aligns with the Department of Conservation’s Healthy Nature, Healthy People initiative designed to get people out enjoying parks and recreation areas. The first of the walks have been mapped, with maps available on the Healthy Families Invercargill and Invercargill City Council websites. Green footprints have also been painted on footpaths to mark the first route. Healthy Families Invercargill manager Jared Cappie said creating the CBD walks provided people with easy opportunities to get active. The walks can all be done at individual pace, and people can choose to do as much as or as little of the walk as suited them. ‘’It’s an easy way to get in some physical activity during a lunch time, or even on the weekend with the family,’’ he said. It was also an example of organisations collaborating to benefit the health and wellbeing of the community, he said. Invercargill City Council city centre co-ordinator Kari Graber said the walks are great because it encourages people to fall back in love with their city centre. "We have a really cute little city with interesting shops alleyways and cafes. By getting out and walking people start to see things they may not have known about their city such as our extensive mural collection. Plus Invercargill is flat so anyone can conquer a short city walk." Sport Southland chief executive Brendon McDermott said encouraging people to get active every day was a key part of the work being done at Sport Southland, and the walks would give people another opportunity to do that. Click here for more information about the inner city walk and for the walk map. 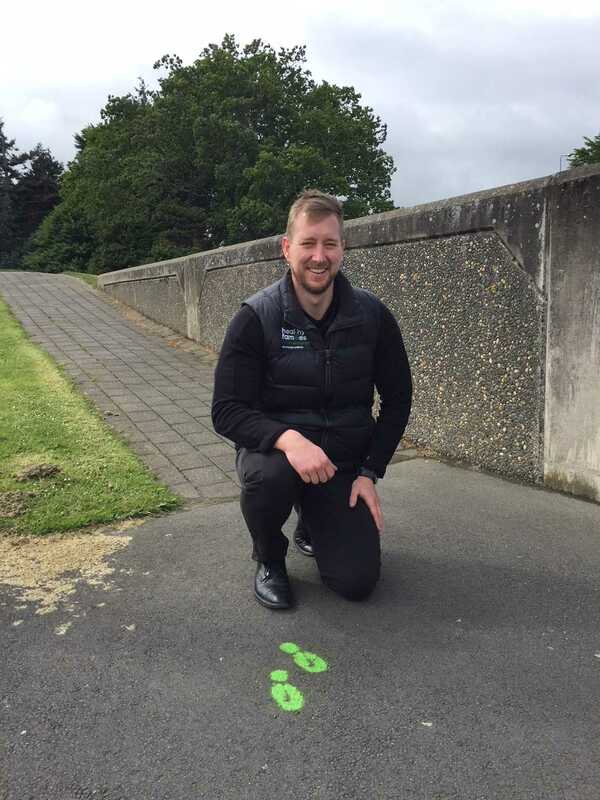 Photo: Healthy Families Invercargill manager Jared Cappie shows off some of the footprints that have been painted as part of the inner city walks.